Over the past decade we've learned that billions of people carry a mysterious specter in their DNA that strongly increases their risk for life threatening cardiovascular diseases, such as heart attacks, aneurysms or strokes, no matter what diet, exercise or medical regimen they follow. Now, Scripps Research scientists have made a major breakthrough in unveiling this medical mystery by precisely cutting the DNA culprit from the genome, which prevents blood vessel cell abnormalities related to these devastating diseases. In a paper published December 6, 2018, in Cell, the researchers report that a large block of DNA, known as the 9p21.3 cardiovascular risk haplotype, causes abnormalities in vascular smooth muscular cells—the cells in blood vessel walls that normally allow them to expand and contract. 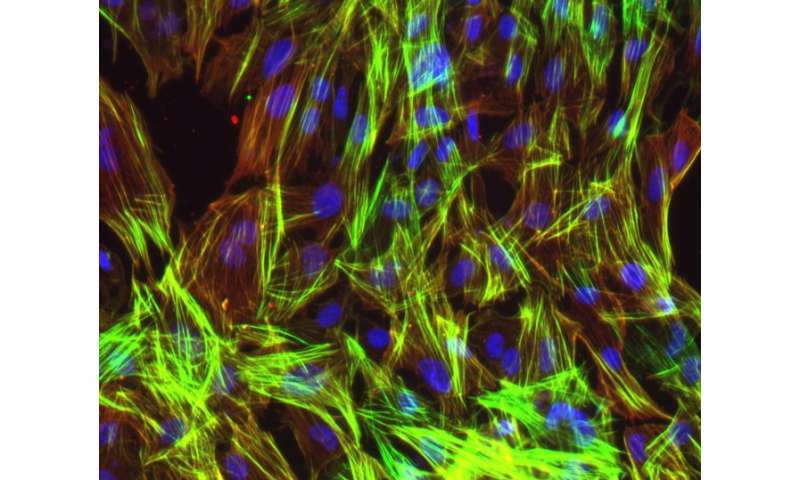 These cells also can dysfunction and contribute to plaques that clog blood vessels, leading to heart attacks and stroke. "We've known for more than a decade that the 9p21.3 haplotype was the most influential genetic risk for cardiovascular disease cases—accounting for an astonishingly large 10-15 percent of cases in the United States per year. But, until now we've been in the dark about what it might be doing to cause this," says Kristin Baldwin, a professor at Scripps Research and senior author on the new paper. "Now, with strong evidence suggesting the 9p21.3 haplotype undermines the stability and function of vascular muscle cells, we may have a opened a new route to interventions that could impact many millions of people worldwide." Although researchers knew the haplotype was tied to heightened disease risk, precisely what was happening in people's bodies remained a matter of speculation. One hurdle is that the disease risk haplotype is found only in humans, with poor similarity to regions in mice or other laboratory animals. Another challenge is that this region doesn't harbor any traditional protein coding genes, making it hard to predict what it might do. "We call such regions 'gene deserts', and in the past they were neglected in research because people thought it was 'junk' DNA," says Ali Torkamani, co-author on the paper and an associate professor at Scripps Research and director of genome informatics at Scripps Research Translational Institute. "With rapid advances in genome sequencing and analysis, we are finding that these regions frequently play critical roles in the emergence of disease." The Scripps Research team found that the cells of high-risk individuals showed an unusually broad set of abnormalities, with the risk cells affecting more than 3000 genes—nearly 10 percent of the total human gene catalog. Computer-based examinations of these genes suggested that the muscle cells might be deficient in key functions related to disease. When this was tested by Professor Adam Engler's laboratory at UC San Diego, his team found that the mature high-risk VSMCs were weaklings compared to the low-risk cells, contracting with much less force and less able to cling to their surroundings than low-risk vascular muscle cells. Next, the Baldwin group asked whether these 3000 or so genes might help demystify the influence of around 100 other genes recently linked to coronary artery disease risk. Unexpectedly, the high-risk cells showed changes in more than a third of these (38), suggesting that the 9p21.3 haplotype somehow interacts with or even controls this network of genes. "This study demonstrates the power of genome editing of pluripotent stem cells for studying human genetic risk for disease, especially when risks are in uniquely human regions or gene deserts," says Valentina Lo Sardo, a staff scientist at Scripps Research and first author on the Cell paper. "Our findings not only provide insight into how the high-risk 9p21.3 haplotype undermines vascular health, but also offer a new avenue to study and target gene regulatory networks widely involved in coronary artery disease." "It's remarkable that one region of our genome could have such a significant impact on both the functional and genetic characteristics of these blood vessel cells," says Eric Topol, MD, a co-author on the paper, cardiologist and executive vice president of Scripps Research. "It may be a gene desert without any protein-coding function, but its impact on disease is extraordinary. Now that we know it's role in damaging the vascular wall, we are in a better place to find novel ways to prevent it."